Use the "Add Calendar -> Add Exchange Calendar" command on the File menu. Right-click in the Calendar List and select the "Add Calendar -> Add Exchange Calendar" command from the popup menu. VueMinder Ultimate provides the ability to sync events with Microsoft Exchange Server. The Exchange Server can be local or can be hosted by an online service such as Rackspace or Microsoft Exchange Online. Exchange can sync with most mobile devices, providing an alternative to Google Calendar for users that would like to keep VueMinder and their mobile devices in sync. 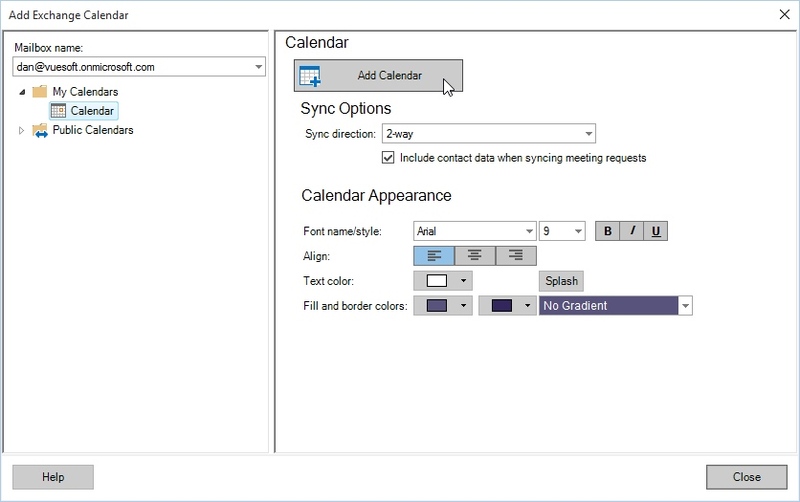 Syncing with Exchange also provides seamless integration of calendar data between Outlook and VueMinder. VueMinder can only sync with Exchange Server 2010 or later. Earlier versions of Exchange Server are not supported. Also, this feature requires VueMinder Ultimate. It's not available in the Pro and Lite versions. To sync VueMinder with a calendar located on an Exchange server, click the "Add Calendar -> Add Exchange Calendar" command on the File menu. Note, this requires an existing Exchange calendar. After clicking "Add Exchange Calendar", a connection window will appear. VueMinder can sync with any number of mailboxes, even on different Exchange servers. 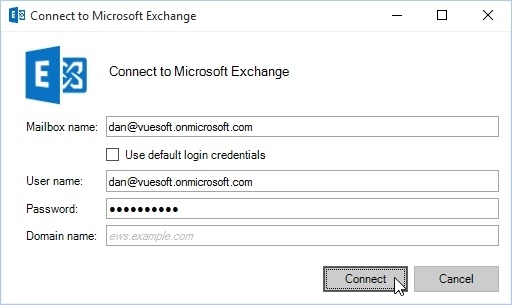 If the Exchange server is local, you can usually just enter your email address. The "Use default login credentials" box should also be checked. VueMinder will attempt to "autodiscover" the Exchange server details and establish a connection. If autodiscovery fails, or if the Exchange server is hosted by an online provider (such as Exchange Online), uncheck the "Use default login credentials" and enter your login information. The "Domain name" field is optional. When connecting to a server that is hosted by an online provider, the domain name can be left blank. Click the "Connect" button when finished. It might take a few seconds for the connection to be established. 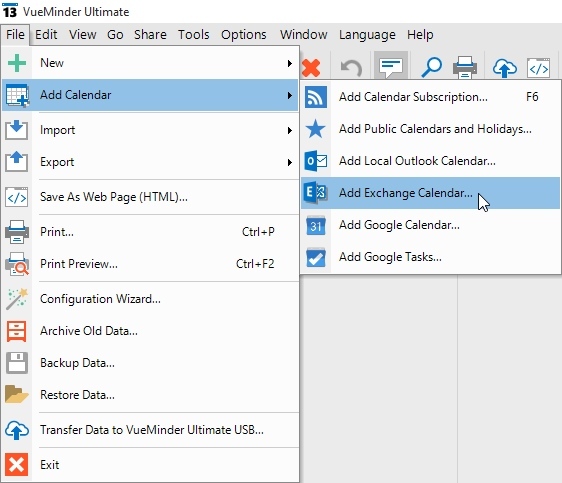 After connecting, the "Add Microsoft Exchange Calendar" window will appear, listing the available calendars. The current mailbox can be changed by clicking the "Mailbox name" drop-down. A calendar can be added to VueMinder by clicking its name and then clicking the "Add Calendar" button. The sync direction and calendar appearance can also be modified prior to adding the calendar. When a calendar is first added, it might take several minutes or longer to initially sync. This is normal and the process has been as optimized as possible. The bottleneck is in the amount of network communication that needs to happen between VueMinder and the Exchange Server to establish the initial sync. VueMinder will show a progress bar while the initial sync is in progress. Do not exit VueMinder until the sync has completed. After the calendar has initially synced, subsequent syncs will happen much more quickly - usually in under a second. 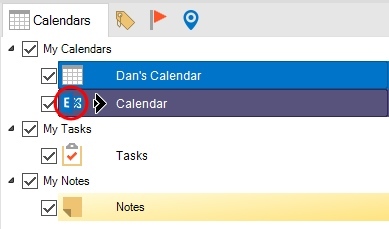 When a calendar is synced with Exchange, an Exchange icon will be shown to the left of the calendar's name in the Calendar List. 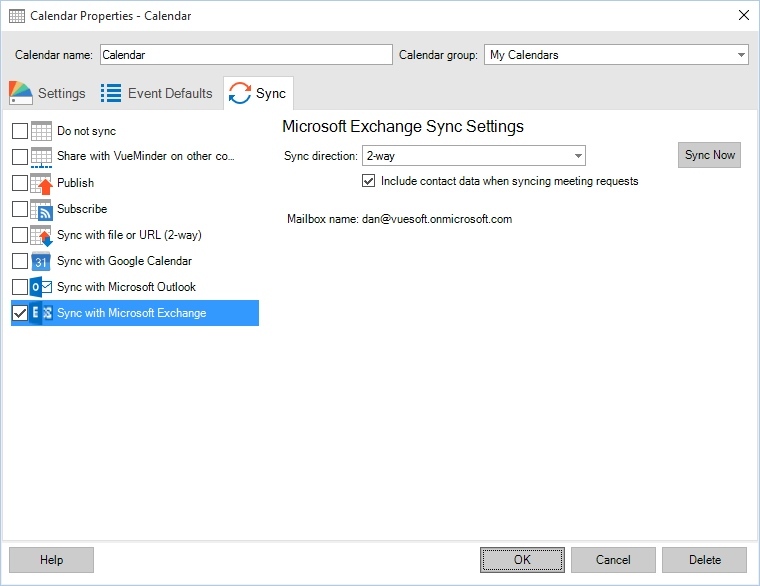 To modify the Exchange sync settings, double-click the calendar to open the Calendar Properties and then click the "Sync" tab. Syncing will happen automatically. If this doesn't happen, the Sync Now button can be clicked to force a sync. The sync direction can also be modified to "2-way" or "1-way Microsoft Exchange to VueMinder".